This is a scalable context timeline. It contains events related to the event 8:53 a.m. September 11, 2001: Otis Fighters Airborne, Allegedly Ordered toward New York. You can narrow or broaden the context of this timeline by adjusting the zoom level. The lower the scale, the more relevant the items on average will be, while the higher the scale, the less relevant the items, on average, will be. According to Terry Biggio, the operations manager at the FAA’s Boston Center, the center initially thought Flight 11 “was a catastrophic electrical failure and… was diverting to New York” (see (8:21 a.m.) September 11, 2001). [Federal Aviation Administration, 10/19/2002] However, at about 8:24 a.m., controllers heard two radio transmissions from it, with the voice of a hijacker declaring, “We have some planes” (see 8:24 a.m. September 11, 2001). Pete Zalewski, who is handling Flight 11, says that after the second of these: “I immediately knew something was very wrong. And I knew it was a hijack.” He alerts his supervisor. Lino Martins, another Boston air traffic controller, says, “the supervisor came over, and that’s when we realized something was serious.” [Christian Science Monitor, 9/13/2001; MSNBC, 9/11/2002; 9/11 Commission, 6/17/2004] However, two senior FAA officials—Bill Peacock and David Canoles—later say that the hijacker transmissions were not attributed to a flight, so controllers didn’t know their origin. [Washington Times, 9/11/2002] An early FAA report will similarly refer to them as having come “from an unknown origin.” But right away, the center begins notifying the chain of command that a suspected hijacking is taking place (see 8:25 a.m. September 11, 2001). [Federal Aviation Administration, 9/17/2001 ] However, some reports claim that controllers decided Flight 11 was probably hijacked earlier than this, by about 8:20 a.m. (see (8:20 a.m.) September 11, 2001). The hole caused by the Flight 11 crash. [Source: Reuters]Flight 11 slams into the WTC North Tower (Building 1). Hijackers Mohamed Atta Waleed Alshehri, Wail Alshehri, Abdulaziz Alomari, and Satam Al Suqami presumably are killed instantly, and many more in the tower will die over the next few hours. Seismic records pinpoint the crash at 26 seconds after 8:46 a.m. [CNN, 9/12/2001; New York Times, 9/12/2001; North American Aerospace Defense Command, 9/18/2001; USA Today, 12/20/2001; Federal Emergency Management Agency, 5/1/2002, pp. 1-10; New York Times, 5/26/2002; USA Today, 8/12/2002; Associated Press, 8/21/2002; Newsday, 9/10/2002] The NIST report states the crash time to be 8:46:30. [National Institute of Standards and Technology, 9/2005, pp. 19] The 9/11 Commission Report states the crash time to be 8:46:40. [9/11 Commission, 7/24/2004, pp. 7] Investigators believe the plane still has about 10,000 gallons of fuel (see 8:57 a.m. September 11, 2001). [New York Times, 5/26/2002] The plane strikes the 93rd through 99th floors in the 110-story building. No one above the crash line survives; approximately 1,360 people die. Below the crash line, approximately 72 die and more than 4,000 survive. Both towers are slightly less than half full at the time of the attack, with between 5,000 to 7,000 people in each tower. This number is lower than expected. Many office workers have not yet shown up to work, and tourists to the observation deck opening at 9:30 A.M. have yet to arrive. [USA Today, 12/20/2001; National Institute of Standards and Technology, 9/2005, pp. 20-22] The impact severs some columns on the north side of the North Tower. Each tower is designed as a “tube-in-tube” structure and the steel columns which support its weight are arranged around the perimeter and in the core. The plane, which weighs 283,600 lb and is traveling at an estimated speed of around 430 mph (see October 2002-October 2005), severs 35 of the building’s 236 perimeter columns and damages another two. The damage to the South Tower’s perimeter will be similar (see 9:03 a.m. September 11, 2001). [National Institute of Standards and Technology, 9/2005, pp. 5-9, 20, 22] The perimeter columns bear about half of the tower’s weight, so this damage reduces its ability to bear gravity loads by about 7.5 percent. [National Institute of Standards and Technology, 9/2005, pp. 6] The actual damage to the 47 core columns is not known, as there are no photographs or videos of it, but there will be much speculation about this after 9/11. It will be suggested that some parts of the aircraft may have damaged the core even after crashing through the exterior wall. According to the National Institute of Standards and Technology (NIST): “Moving at 500 mph, an engine broke any exterior column it hit. If the engine missed the floor slab, the majority of the engine core remained intact and had enough residual momentum to sever a core column upon direct impact.” [National Institute of Standards and Technology, 9/2005, pp. 107] According to NIST’s base case computer model, three of the core columns are severed and another ten suffer some damage. [National Institute of Standards & Technology, 9/2005, pp. 189 ] If this is accurate, it means that the impact damage to the core reduces the Tower’s strength by another approximately 7.5 percent, meaning that the building loses about 15 percent of its strength in total. This damage will be cited after 9/11 by NIST and others researchers as an event contributing to the building’s collapse (see October 23, 2002 and October 19, 2004). In addition, some of the fireproofing on the steel columns and trusses may be dislodged. The original fireproofing on the fire floors was mostly Blazeshield DC/F, but some of the fireproofing on the flooring has recently been upgraded to Blazeshield II, which is about 20 percent denser and 20 percent more adhesive. [National Institute of Standards & Technology, 9/2005, pp. xxxvi, 83 ] Photographs and videos of the towers will not show the state of fireproofing inside the buildings, but NIST will estimate the damage to it using a computer model. Its severe case model (see (October 2002-October 2005)) will predict that 43 of the 47 core columns are stripped of their fireproofing on one or more floors and that fireproofing is stripped from trusses covering 60,000 ft2 of floor area, the equivalent of about one and a half floors. NIST will say that the loss of fireproofing is a major cause of the collapse (see April 5, 2005), but only performs 15 tests on fireproofing samples (see October 26, 2005). [National Institute of Standards and Technology, 9/2005, pp. 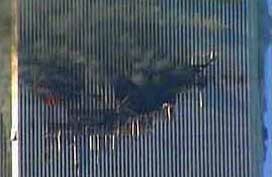 23] According to NIST, more fireproofing is stripped from the South Tower (see 9:03 a.m. September 11, 2001). Major General Paul Weaver, director of the Air National Guard, provides reporters with details of the 9/11 attacks and the US military’s response to the hijackings. Speaking at the Pentagon, Weaver gives reporters a detailed account of what happened on September 11. He says Air National Guard planes responded to the hijackings on orders from NORAD’s Northeast Air Defense Sector (NEADS), which was alerted to the hijackings by the Federal Aviation Administration (FAA). Fighters Took Off Too Late to Catch Flight 175 - Weaver says that at 8:53 a.m., seven minutes after Flight 11 crashed into the North Tower of the World Trade Center (see 8:46 a.m. September 11, 2001), two F-15 fighter jets took off from Otis Air National Guard Base in Cape Cod, Massachusetts, in pursuit of Flight 175, the second plane to be hijacked (see 8:46 a.m. September 11, 2001 and 8:53 a.m. September 11, 2001). However, Weaver says, the FAA had only told NEADS that “there was an airplane that had a problem,” and at that time it was unclear if Flight 175 had been hijacked. He says that although the fighters flew at over 500 miles per hour, they were unable to catch up with Flight 175 before it hit the South Tower of the WTC at 9:03 a.m. (see 9:03 a.m. September 11, 2001). More Fighters Were Launched Just before Pentagon Was Hit - Weaver says Flight 77, the third aircraft to be hijacked, flew west for 45 minutes and then turned east, and its transponder was turned off. He does not claim that the military received notice that it had been hijacked, but says NEADS scrambled F-16 fighters that were on alert at Langley Air Force Base in Virginia at 9:35 a.m. (see 9:24 a.m. September 11, 2001 and (9:25 a.m.-9:30 a.m.) September 11, 2001). Two minutes later, at 9:37 a.m., the Pentagon was hit (see 9:37 a.m. September 11, 2001). The F-16s, he says, subsequently remained on patrol over the Pentagon. NORAD Learned of First Hijackings Too Late to Defend the WTC - The chronology provides the times at which NORAD’s Northeast Air Defense Sector (NEADS) was alerted to the hijackings and when fighter jets were scrambled in response to the hijackings. It states that the Federal Aviation Administration (FAA) notified NEADS about Flight 11, the first hijacked aircraft, at 8:40 a.m. 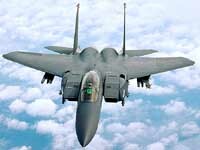 In response, the order was given to scramble two F-15 fighters from Otis Air National Guard Base in Cape Cod, Massachusetts, at 8:46 a.m. (see 8:46 a.m. September 11, 2001), the same time that Flight 11 crashed into the World Trade Center (see 8:46 a.m. September 11, 2001), and the fighters were airborne at 8:52 a.m. (see 8:53 a.m. September 11, 2001). The FAA notified NEADS about Flight 175, the second hijacked aircraft, at 8:43 a.m., according to the chronology. When Flight 175 crashed into the WTC at 9:03 a.m. (see 9:03 a.m. September 11, 2001), the chronology states, the Otis fighters were 71 miles away from New York.